The DS400 Pressure Switch is the successful combination of intelligent pressure switch and digital display and is suitable for universal usage in machine and plant engineering. The stainless steel globe housing is applicable for hard conditions due to its high functionality and robustness and rotates so that its position can be adapted to the installation position. The 3-wire-version has an optional analogue output with configurable start and end point allowing the DS 400 to be used as a precise pressure transmitter. The 2-wire-version features an analogue output as standard, and is optionally available with Ex protection. The 4-digit LED display, which can rotate within the housing, shows the system pressure and allows programming. Configuration is menu controlled and is also easy to handle without previous knowledge. 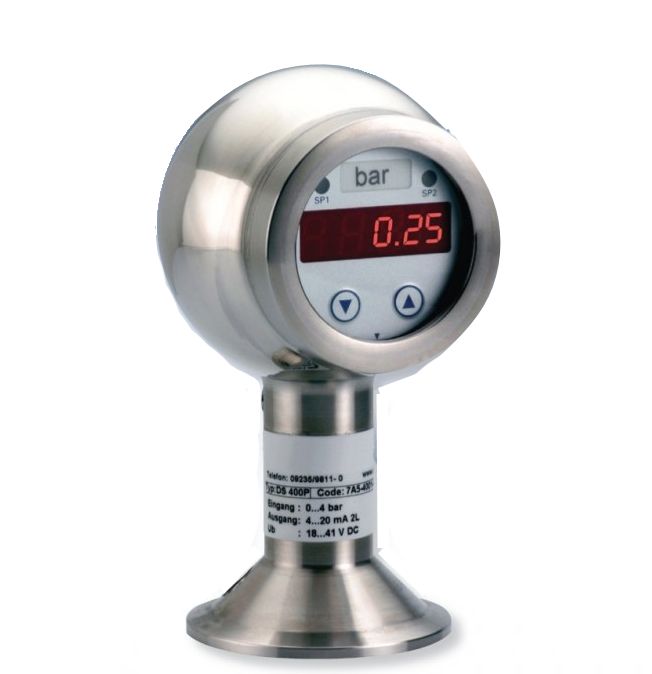 Intelligent, intrinsically-safe, electronic hygienic pressure switch completely in stainless steel. A combination of intelligent pressure switch and digital display unit, with or without analogue output, which is suitable for aggressive media and hazardous areas.